Works Performance shock absorber.Fully adjustable compression, rebound and available hydraulic pre-load adjuster. 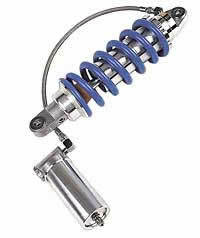 Öhlins shock absorber.Fully adjustable compression, rebound and hydraulic pre-load adjuster. Hyperpro shock absorber.Standard shock is rebound adjustable. Reservoir shock has high and low speed compression damping adjustment and rebound adjustment.Both have optional remote hydraulic pre-load adjustment. Neoprene Fork Guards made by Noj, Inc.
$20 a pair from No Ordinary Journey. Bike on the center stand, rear wheel in the air. You need someone to hold on to the front of the bike. Grab the rear tire and try to move it side to side. There should be no noticeable play even with your full strength. If there is, then your swing arm bushings are bad. Swing arm bushings are often ignored, but they can cause quite large handling problems, which interestingly almost always feel as if they are caused by the front end. Bike on the center stand, rear wheel in the air. Get about15 feet (5 meters) of string. Loop the center of the string around the front of the front wheel once, at about 4 o'clock, leaving about 6 feet of string free on each side. Bring the two free string ends to the back of the bike, one on each side.Now, hold the string ends up against the rear outer edges of the rear tire at about 8 o'clock. Now you need a helper to center the front wheel - that is, turn the front wheel until the two strings are equal distances from the rear edges of the front tire. The string should also now be equal distances from the front edge of the rear tire. If it is not equal distances, then either your rear wheel is offset or it is canted. Many shocks have rebound damping adjusters. Yours should be set so that when going over railroad tracks or speed bumps, the bike recovers quickly with no Cadillac or waterbed type oscillations. This will generally prove to be a bit firmer than the factory spec. If you have compression damping adjusters, unless you're at a race track I recommend full soft on these. ST1300 only: To adjust your rear shock damping, get a long flat screwdriver. Insert it through the hole about 4"front of the right side passenger foot peg and into the damping adjustment slot on the shock body. Turn the damping to full hard - turn the screwdriver clockwise until it stops. Now back off the damping to your preferred level. TheHonda spec is one full turn back from full hard. I recommend one half turn back from full hard. Adjusting your spring preload requires two people. 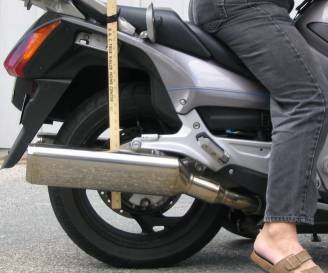 Get a yard stick (typically free at any decent hardware store) and attach it temporarily to your bike somewhere. I used electrical tape and put it on my passenger grab rail. You need to be able to measure the position of the rear axle, or something quite close to it. Here, I'm measuring the position of the oil fill plug on the rear end. This plug has a hex nut, and I'm checking against one of the points on the hex nut. Place the bike on the center stand, and with the rear wheel in the air, record the position of the rear axle. Here, I get 35½". That's just where the axle points to, it's not the distance from anything in particular. Write this down somewhere. Now, take the bike off the center stand and sit on the bike. Keep it as upright as possible, and as little weight as possible on your feet. Bounce up and down a little bit, until you are convinced the suspension is in the normal position, not stuck a little bit off by friction. Have your helper record the position of the rear axle. Here, my yardstick reads 33 ½". So, when I'm sitting on my bike, the rear suspension is compressed two inches. My ST1300 has 4 ¾" of rear wheel travel. You want your suspension to compress about a quarter to a third of the total travel when you're just sitting on the bike; that's about 1 ½" for me. So, I need to increase my preload a bit to raise up the rear end. One-third is normal for sporty cruising. If you want to play serious racer-boy, crank up the preload to one-quarter. It's been claimed that most of the traffic problems in LA are caused by the fact that, at any given instant, half the men are driving fast to impress their girlfriends and the other half are driving slow to placate their wives. If you have three people handy, you may repeat this measurement with your SO (SWAMBO to you brits) sitting on the passenger seat, and find the correct preload position for riding two up. Now, knowing this, you can easily switch between the two depending on if you're riding solo or with a passenger. Helpful hint: your SO can give you a bit of acrylic fingernail polish to mark the two positions. If you can't get the preload set high enough to get the sag right, you need a heavier spring. The ST1300 is under sprung for two-up. The stock spring is a 900 lb, and a more appropriate spring is an 1100 lb. You need a center stand or engine jack to do this. You must be able to keep your front wheel in the air with the bike immobile. Put the bike on its center stand. Do whatever is necessary to get the front wheel in the air. ½" is fine. Remove the fork caps so that your springs are loose and your front end moves up and down freely. Loosen the front axle, the fender bolts, and all the triple clamp bolts. If you have a fork brace, loosen that too. Lift the front wheel, sliding it up the fork tubes until you hit the bottoming stops inside the forks. 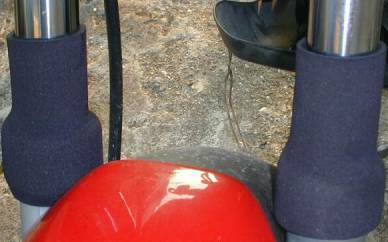 Use a tie-down to hold the wheel up in this position, with the forks bottomed out. Now, with the forks bottomed out, the fork sliders are inside the fork lowers as much as they ever will be, and the forks are lined up as perfectly as they can be. Now is the time to tighten everything, the triple clamp bolts first, then the axle, then the fender bolts. If you have a fork brace, tighten that last. Release the front wheel so that the forks extend fully, topping out. Replace the fork caps. That's it, that's as good a front end alignment as you can get. 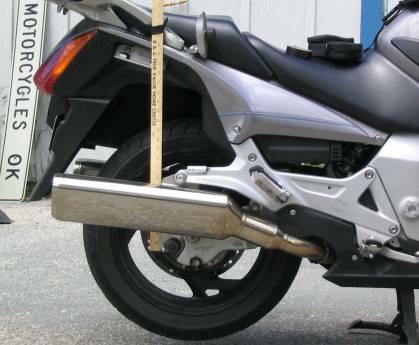 Most motorcycles don't have much in the way of front suspension adjustments. Here, I'll tell you how to adjust your static sag. If you have compression and rebound adjusters, you're on your own with these. Put the bike on its center stand and/or use an engine jack to get the front wheel in the air. ½" is fine. Measure the distance from the bottom of your lower triple clamp to the top of your fork leg seal. If this is inconvenient, pick some other place on the lower fork leg, like one of the bolts on a disk caliper. Write down this number. Take your bike off the center stand. Sit on the bike, grab the front brake, and work the forks up and down a bit.Get the forks to their resting place while holding up your weight. Measure the distance from the bottom of your lower triple clamp to your fork leg seal, or the disk caliper bolt, or whatever you chose. Subtract this distance from the unloaded distance you measured above. This is your static sag. An easy way to measure this is to tape a yardstick onto the forks, with the end of the yardstick exactly at the top of the top triple clamp when the front forks are unloaded. You can the read the sag right off the yardstick. Your static sag should be ¼ of your total fork travel. If your fork travel is 150mm, your static sag should be about 38mm. If your fork travel is 120mm, your static sag should be 30mm. If your sag wrong, change your fork preload adjusters to make up the difference. If you have too much sag and your pre-load adjusters don't have enough travel or you don't have pre-load adjusters, you can still fix this problem. Place the bike back on the center stand. Remove your fork caps. Measure the outside diameter of your fork springs. Buy a couple of washers which are as close as you can get to this size. Get some PVC water pipe, whatever size is closest to your spring diameter. Cut two lengths of the PVC pipe which are the length you wish to raise your front end. Place the washers on top of the fork springs, then the PVC pipe, then the fork caps. Seal up the forks, you're done. If your forks are riding too high and you need more sag, you still have hope. Open up your forks and see if there's factory spacer on top of the springs. If there is, you can cut down this spacer, or replace it with a shorter one made of PVC.